Photo shows a view of BR no. 49194 with a 24K shed plate. 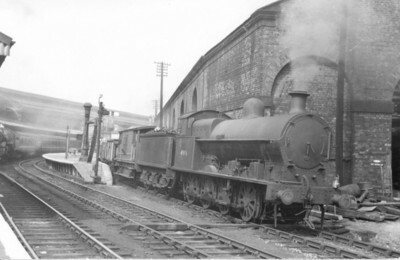 On the left is a BR Standard Class '4' 4-6-0. Ted suspects that this is Preston but it would be nice to have the full story from those who know. Yes, Preston East Lancs. The goods train is pulling away (the home signal is out of sight) on the up through line (Platform 13) from Preston No.4. The East Lancs goods warehouse is very prominent. The BR Class 5 is in bay Platform 11 on a train of non-corridor stock - doubtless a stopping service to Rochdale or somewhere. Date mid-1950s. As no. 9194 was withdrawn in October 1949 it seems likely that this engine is actually no. 49196, which was shedded at Preston for a few years until it was transferred to Carnforth in September 1961, and withdrawn the following month. Preston shed, formerly 10B, was given the number 24K in April 1958. There is a photo by W.D. Cooper in his book LMS Days showing ex-L&Y Dreadnought no. 10412 on a Liverpool train, taken from almost this spot in August 1947. Nothing visible had changed between then and when this picture was taken, eleven to fourteen years later. This is taken on the East Lancs side of Preston - now subsumed into a car park.